Rhonda and I have lived aboard our boat for over a year now. In that time, we’ve gotten pretty used to having a virtually unlimited supply of fresh water. When the tank gets low, we just stretch out the dock hose and refill the tank. So the idea of having to switch to water rationing once we depart for our Life On The Hook™ in a few months lacks appeal. It’s just so darn civilized to clean the boat, wash and rinse dishes and flush the toilet with fresh water, and be able to take actual showers instead of sponge baths. We’d rather not have to meter our water use by the teaspoonful, lug jerry cans of water to the boat in the dinghy, or have to figure out how to catch rainwater to stretch the water supply. We also know we’ll soon be visiting places like the Dry Tortugas, where there just isn’t any water to be had. It’s sad to contemplate having to leave a place you’re not done experiencing just because the water gauge is getting low. And we’ve been following the blogs of other sailors who have visited islands in the western Caribbean that don’t have municipal water supplies at all. Everyone’s drinking water comes from personal rain catchments and cisterns, and in order to fill your tank, you have to ask someone to part with some of their precious supply. No, we knew when it came to water, we wanted to be as self sufficient as possible. There was definitely going to be a watermaker in our future. I fell in love with this system the first time I saw it. 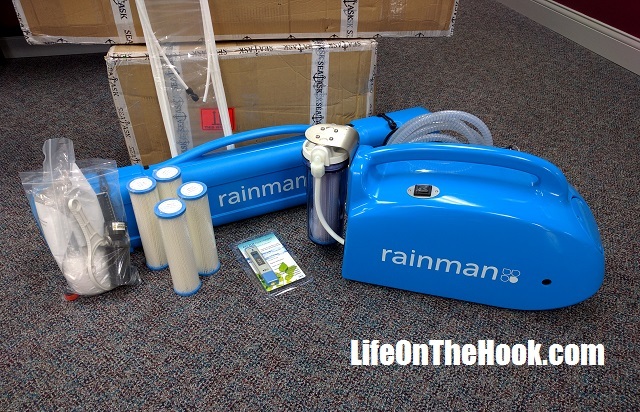 It’s the Rainman portable desalination system, and ours was delivered to Rhonda’s office earlier today. We opted for the high output 115 volt model. Rainman makes a unit run by its own gasoline engine, but the electric model is optimized to run from a Honda portable generator, which we already happen to have. And it seemed to be money well spent to go with the 32 gallon per hour (GPH) high output model rather than the 16 GPH standard model. The cost difference wasn’t that large, and it will fill the water tank in half the time, which will cut down on generator runtime. I’m guessing about one hour of watermaking every third day ought to keep us in all the fresh water we need. The thing I probably like the most about the Rainman system is its portability. Since it doesn’t become a permanently installed piece of the boat, we’ll be free to take it with us if we ever buy another boat, or sell it if we decide to move on from cruising (gasp!) and buy an RV or return to being dirt dwellers. The system arrived with the reverse osmosis membranes pickled (preserved for storage), and we won’t be using it until after we depart for the Caribbean. But after trading emails with the dealer for quite a while, we were able to negotiate a Miami boat show price (the show starts next week), probably the best deal of the year on this system, so we went ahead and placed the order now. We’ll post an update after we’ve had an opportunity to use it a bit to let you know what we think. 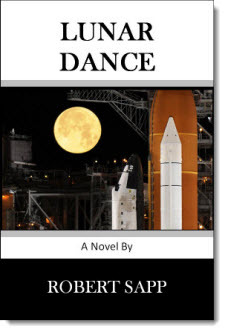 But we expect that our Rainman will have no problem providing us with copious quantities of clean fresh water so that life aboard will be just a bit more comfortable. This entry was posted in What? and tagged Hunter 376 watermaker, Rainman watermaker, watermaker review on February 3, 2016 by Robert. Thanks for the very kind words. We’re glad you’re excited about your Rainman. We wish you great adventures and hope your new watermaker lives up to expectations. We’re considering getting a Rainman and would be curious to know what your thoughts are on it after using it. Did it live up to expectations? Any issues? Any tips you have? Thanks! Just buy it, it’s terrific. Get the high output model.